Baby Trend Safari Kingdom Walker Just $27.88! Down From Up To $69! You are here: Home / Great Deals / Baby Trend Safari Kingdom Walker Just $27.88! Down From Up To $69! 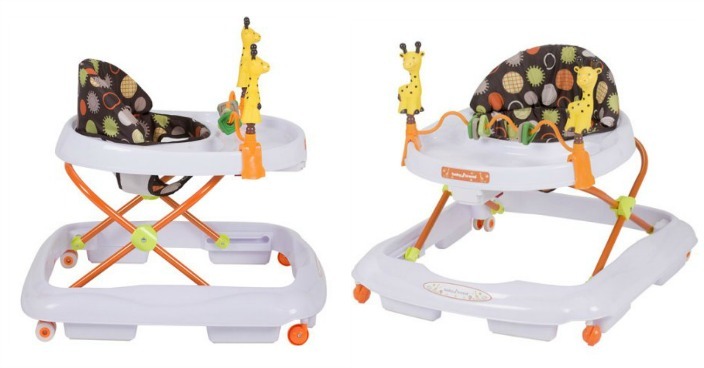 Right now you can get this Baby Trend Safari Kingdom Walker for just $27.88 (Reg. $69) at Walmart! The Baby Trend Walker in Safari Kingdom is designed for comfort and with your baby’s needs in mind. The Baby Trend Walker is a breeze to set up, clean and fold, and it’s easy and fun for your baby to use. Along with the multi-directional wheels that offer freedom of movement, the extra-wide base provides superior support and stability so your baby will enjoy playing and moving about. The Walker Safari Kingdom has a large surround tray and removable toy bar! The baby walker also features a three-position height adjustable and high-back padded seat for added comfort.